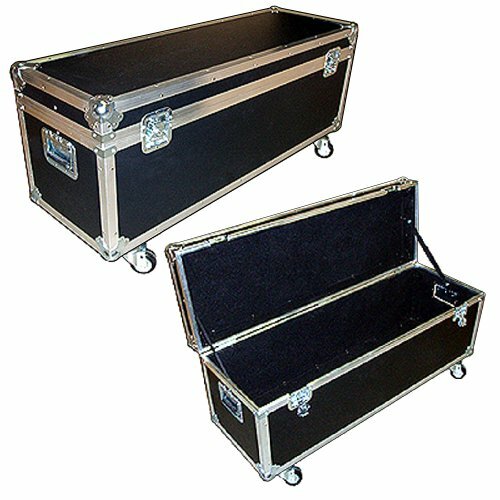 This case does not fit all drum stands and hardware on the market - Please measure your equipment before purchasing. This case is constructed of 3/8 inch plywood with a black PVC laminate exterior. The case is assembled with heavy gauge aluminum extrusions and machine split riveted throughout finished with steel ball corners. All catches and handles are spring loaded and recessed into the case for strength and sheer resistance. The lid hinges open and has a carpet lined interior. Heavy duty 3 Inch swivel casters are included with this case (installation required). If you have any questions about this product by Roadie Products, Inc., contact us by completing and submitting the form below. If you are looking for a specif part number, please include it with your message.